In a web site development context, a composite design, or comp, is a mockup of a single web page, showing the layout of its textual and graphic components. We have found that a "comp" is an effective way to model a web page before any coding is started. 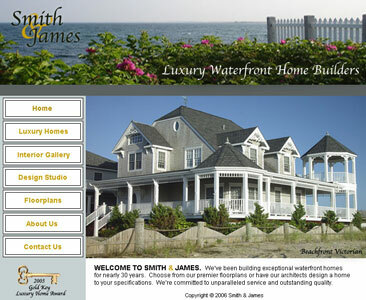 The client can see, up-front, what the basic layout and appearance of the page will be like. 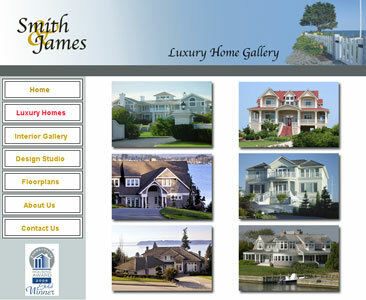 The comp shown at above right was designed for a luxury waterfront home builder. The builder name, information, and home pictures were fictional for the purposes of this comp. 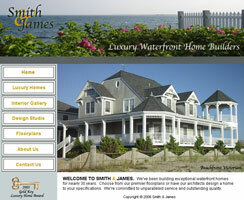 We used a grid-based design for this web site, with attention to alignment details. The navigation palette is easy to use, and we have used a simple sans-serif font for readability. The logo was also designed and placed on a themed background. The home gallery page shows sample homes the home builder has completed. The interior design gallery page would be structured similarly, with appropriate photos of the home interiors. The floor plan page would show home blueprints.